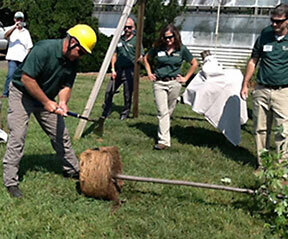 Do you know what a professional resource we have in our National and State Gold Sponsor Bartlett Tree Experts? For starters they have offices all over the United States with a local representative who works out of the Kenmore, WA office to service our clients in the Pacific Northwest. His name is Jake Johnson. Jake is an ISA Board Master certified arborist who has been working in the Seattle area for 10 years. Secondly, every local office has the support of the diagnostics lab in Charlotte, NC with the expertise of four Ph.D. researchers on staff. New this year, is a diagnostics lab in San Rafael, CA which services the west coast and is run by University of Washington graduate Dr. Drew Zwart. Recently I had the very unique and special educational opportunity to visit Bartlett Trees Experts Labs in North Carolina -- a prize won at Vendor Night at the APLD International Design Conference in Berkeley. 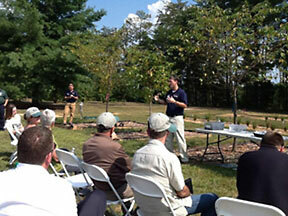 In the beautiful setting of the 400 acre Bartlett Arboretum, 60 participants learned about best practices for tree planting and care, pest management, and new technologies in landscape tree stewardship. We also had opportunities to hear how our colleagues in other parts of the country manage their landscapes and trees for long term success. Why are trees so important? While standing under a 100 year old oak, the Bartlett staff aptly pointed out that in any given landscape the one thing that persists beyond the fashion of perennials, shrubs, residents and sometimes structures is the trees. While the conference was packed with information and networking, one of the strongest messages was "So you think you know how to plant a tree...."? Yes, I thought, I know how to plant a tree, doesn't everyone? We all know that we have to dig the hole more than twice the size of the root ball, and we need to amend the native soil with compost and remove the burlap and cage. Then we know we need to score the root bound tips and find the root flare to plant at grade. Job done, right? Not so fast according to Dr. Kelby Fite at Bartlett. One hot afternoon in the field we all watched as Dr. Fite and a lab technician took an axe to a container grown, 2" caliper tree. He cut away the bulging 15 gallon container, scored and discarded the wrapped roots, large feeder roots and most of the planting medium ( which in this case was bark) until you could see the very center of the root structure. Knowing that the low-margin industry of tree propagation "pots out" the plants without sufficient attention to the rooting detail, he cut into the mass of roots that started curving at the 1 gallon, 5 gallon, and 10 gallon "pot size". He then proceeded to cut all curved or misshapen roots, all the way into the core of the plant until all that remained were various sized roots that radiated out like spokes on a bicycled. At this point I would have thought the tree was dead, as there wasn't much left. While he admits that the tree will be under stress for the first year or so after transplanting, their research shows that trees tend to thrive long term with a properly radiated root structure that won't wrap or girdle the tree. To prove this point he had samples of previous excavated tree root stumps. What they found was that the trees that were root pruned in the typical industry method had a much greater mass of tangled, knotted and girdled roots much closer to the trunk. On the tree that had been root pruned as described above, the roots grew in a radial fashion, hence providing for a more stable root system that was more vigorous and less likely to girdle long term. The second take home message that resonated with me as an estate manager who manages lots of trees on a less than forgiving site, are the benefits of adding a Biochar amendment to the mulching protocol for stressed or troubled trees. While Biochar has been in the industry for some time now there are still lots of detractors as well as proponents. For me, the most potent evidence was two rows of trees at the lab, one planted in drain rock with Biochar and mulch and the other planted in drain rock and mulch. Clearly the former row of trees was outperforming the latter. This test plot had been repeated throughout the Arboreteum with different plants at different times and all Biochar samples looked significantly better than their "control" partners. For more information about Biochar and its effects please see this article written by Scott Jamieson, Vice President of Corporate Partnerships and National recruiting. 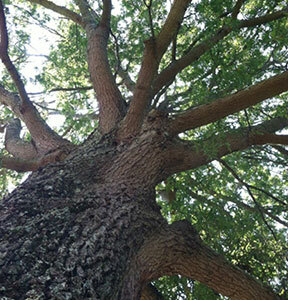 Additionally, Bartlett Tree Experts are researching and testing a number of products that will potentially help reduce the need for pesticides with Neo-nicatinoids which are believed to be related to bee colony collapse, as well as Pheromone attractants to catch other insect pests without compromising the health of the infected tree. This will likely prove useful in the chemical-free fruit tree industry. Lastly we witnessed what I can only refer to as a tree "Ultrasound" of an elderly tree. This was done as part of a tree risk assessment program to determine the extent of potential internal disease or decay not visible on the exterior. This tool is particularly useful for managing large institutional landscapes with aging specimen trees that may pose a threat to public safety -- such as Central Park in New York City or the campus at the University of Washington. It was a fascinating process of attaching wires with nails inserted into the trunk of a tree. The technician taps on the tree in marked locations and the "Arborsonic" software program maps the perimeter of decay within based on sound waves. According to Dr. Bruce Fraedrich, as Bartlett Tree Experts look to the future their focus will be on refining these programs and others, increasing their focus on sustainable solutions in tree and pest management and developing recommendations for sustainable urban planting practices. Bartlett has become expert at solving problems like these and so many more. It's nice to know APLD has a national sponsor with local resources who can help with stewardship of the land. 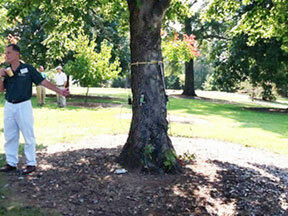 The next time your project calls for a tree expert, try Bartlett Tree Experts. I am sure you will be as impressed as I am. Looking for a proven, talented and dedicated landscape designer? Find the best landscape designers in Washington by clicking here. Contact us today at contactus@apldwa.org for more information about how you can join the Association of Professional Landscape Designers - Washington State Chapter.